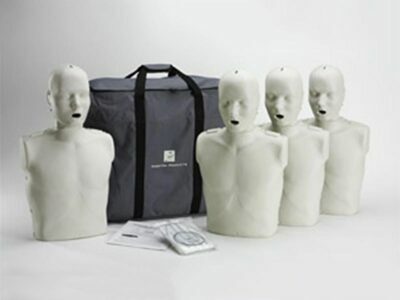 Prestan Adult Light Skin Manikin 4-pack with CPR monitor with 50 face shield lung bags and a nylon carrying case. These manikins designed as a clamshell that accommodates an easy-to-insert face shield/lung bag. Prestan’s revolutionary new CPR Rate Monitor allows for instant feedback to both student and instructor regarding the rate of chest compression. The CPR Rate Monitor allows each student to gauge their rate of compression’s by themselves and allow the instructor to monitor several students. With the patented face/head tilt, the Prestan Manikin simulates the way an actual victim’s head would move if they required CPR. Also, the construction of Prestan Manikins help students use the correct amount of force to compress the chest to the right depth. All Prestan products are latex-free.